Bloggers Roundtable Plus Ken’s Fiery World Segment on the Bic FlameDisk®. The grand tradition continues in our biggest fiery foods blogger round table chat yet! Joining Scott were Joe and Linda Levinson of The Hot Zone Online; Michael Hultquist of Chili Pepper Madness; freelance reviewer “Firehead” Thomas Gately, Ken Alexander of It’s a Fiery World; and Brian and Marilyn Meagher of Hot Sauce Daily. We discuss such topics as what we think is the most under-utilized pepper in sauces and cooking, the crossover between BBQ and hot sauces, and introducing an official annual chilehead holiday. In his regular segment, Ken reviews the Bic FlameDisk®. Flicking Your Bic Was Never This Much Fun!! When I was approached by the Bic Corporation to review their portable grilling gizmo, the FlameDisk®, I tried to visualize a whole bunch of plastic lighters taped to a plate flying through the air at a rock concert! Okay, so I date myself, but I burnt many a finger holding my lighter up proudly at rock concerts, thank you very much! But I digress. This cool and groovy barbecue enhancing, nifty, swifty, pyro based product can take the dirty mess and hassle out of your next tailgate grilling experience. So sit back and enjoy this unique visit with the Bic ™ FlameDisk®! The FlameDisk lights with the “Flick of your Bic”! 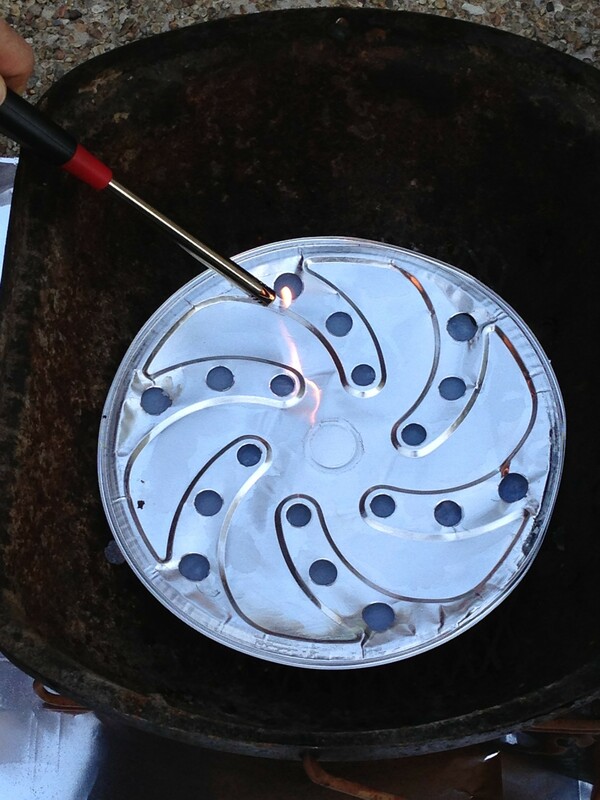 As you can see from the picture, the FlameDisk® is just that – a flat disk with holes that you place in the bottom of your grill and light in place of charcoal! The holes allow the flames of this Bic™ to flick your pre-game load of burgers, dogs, chicken, steak, or whatever it is you decide to grill up on game day, picnic day, or heck, just any old day! I found the instructions simple and the FlameDisk® even simpler than that- downright intuitive! The instructions say to allow a four minute warm-up to achieve 40 minutes of cooking time, and then a 10 minute cool down after the flame goes out (which you can force by covering the Disk), and I found that to be pretty much true. This baby lives up to the reputation of its much smaller, but iconic older uncle, the Bic™ lighter! It is simple, effective, and disposable. Not having to deal with the mess associated with using charcoal briquettes, and right off the bat, the FlameDisk® gets 5 Fiery Worlds for convenience in lieu of charcoal. 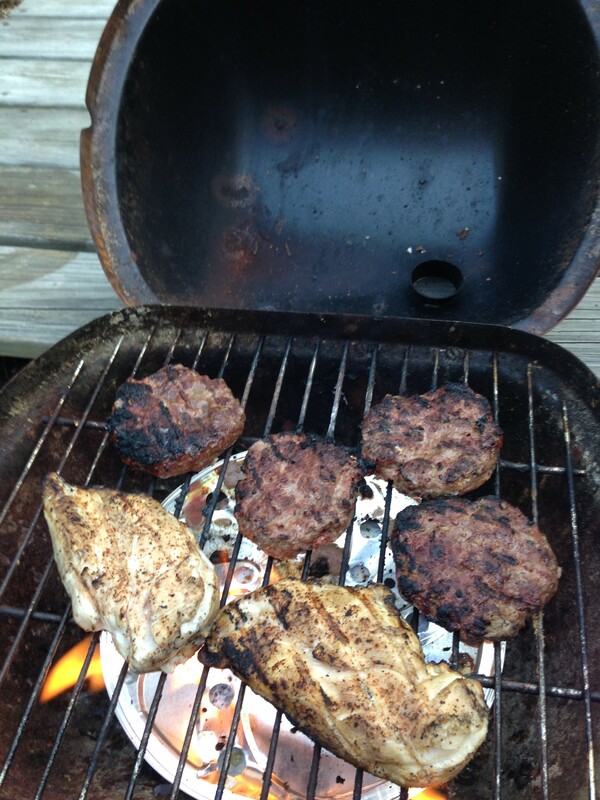 It grilled the chicken and burgers without issue, and I had a little heat left for some veggies, had I been in the mood! I quickly learned that if you don’t have it level, the “fuel” they use distributes unevenly, giving you an uneven heat and more pronounced flames on one side of the disk. My tabletop grill isn’t round, and that was an issue for me trying to keep the disk level. I managed to adjust it for the most part, but I did have to shift the food around a couple of times to keep from scorching. The Flavor is not dissimilar to what you’d get with a gas grill, but I might experiment and put some wood chips on the disk the next time to get a better wood-fire, charcoal flavor. The only other real observation is that there isn’t an effective way to extinguish flare-ups without jeopardizing your flame, but if you’re babysitting your grilled gastric gridiron delights, you can manage and adjust! So it gets 3 Fiery Worlds for flavor, but another 5 Fiery Worlds for novelty, portability, and ingenuity! I’ve already rated it a 5 Fiery Worlds in convenience. According to their website, the FlameDisk® sells for $4.99 list price, which isn’t a bad price for the huge convenience factor, and when I did some web searching, found it on sale at many locations. At time of posting, they also offered a $2.00 off coupon! So before the next big game, don’t battle your grill! 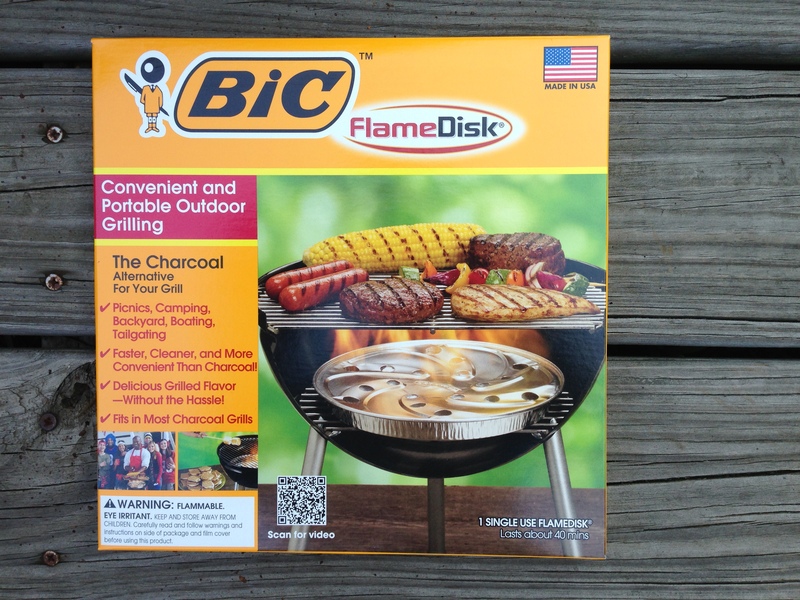 Try out Bic’s new FlameDisk® and save those heated battles for the gridiron!!! And remember, Ladies and Gentlemen, It’s A Fiery World! It’s Hot…No, It’s Sweet…No, It’s Hot….Noooo….It’s Sweeet….Awww Hellfire, Make Up Your Mind! Well, Ladies and Gentlemen, here we are again in Lake Wob……oops, I mean Lake Geneva, Wisconsin, where once again, Merle and Diana at Hellfire Hot Sauce are concocting lovely little potions designed to entice, entertain, and envelope our senses with heat….I mean sweet……no…..heat…..no……sweet……… hea……….STOP!! Stop the Madness!!! (Insert deep breath and a few yoga ommmms here) Of course I’m making light of the latest sauce they sent me to try – Devils Gold – a sauce that celebrates color, heat, fruit, and flavor! Sporting a label that is both appealing and kinda creepy at the same time, this sauce is unique in it’s ability to provide a great heat punch with the flavor of….ummm……fruit punch! 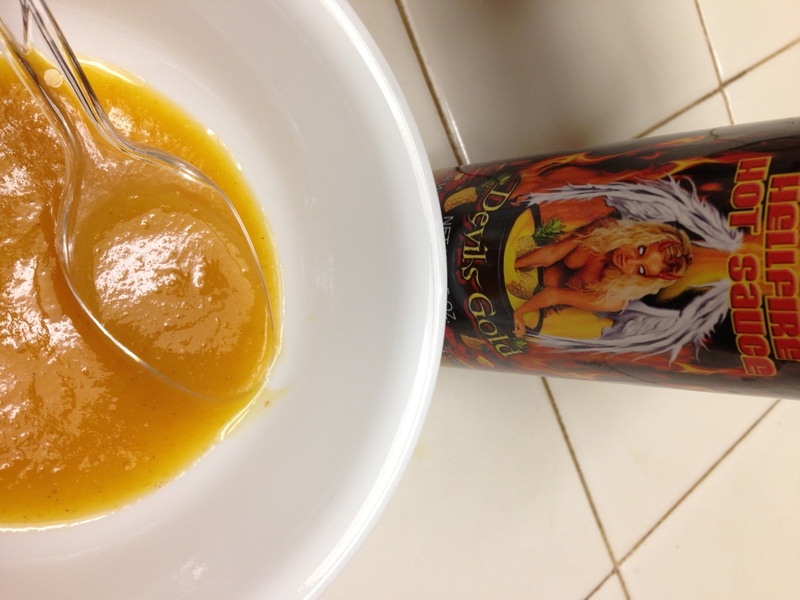 Devils Gold is a beautiful, yellow gold, medium consistency sauce sporting a label with a winged, blank-eyed she-devil babe with her hands in a cauldron of gold and pineapples! A nice visual combination of a sweet face, and piercing, menacing eyes, and well, you’ll have to see the rest and draw your own conclusion (But the sauce ain’t the only hot thing going here…just saying!) When you look at the ingredients of this yellow gold nectar, it reads like a Who’s Who of heat and sweet: Yellow Brain Strain, Fatalii, Trinidad Yellow 7-Pot, Yellow Bhut Jolokia, Yellow Scorpion, Pineapple, Pears, Oranges, Papaya, Vinegar, Sugar, Salt, and “Spices”. So in one delicious 5 ounce package, you get a killer combination of the hottest of the hot peppers all clad in yellow (my favorite color and pepper “flavor”, by the way), and yellow or gold fruits. Once again, Merle and Diana have rocked it out the box with this wonderfully flavored hot sauce! We’ll discuss flavor in a minute, but first I want to talk about what this all-star combo of peppers create – HEAT! Lots of Heat! The heat profile in Devils Gold layers masterfully, beginning with a quick sting that hit the middle of my tongue and quickly rolled it’s way back to my throat, where it built and strengthened, filling my mouth and throat, and then decided to just hang around a while! I’m talking lingering to the extent that I had to actually grab the whipped cream can when I was doing an initial taste test and downed several spoonfuls pretty quickly! You can easily discern the distinct flavor of the scorpions and the fatalii, which always make the back of my tongue and throat burn for a while….But lest you think that Devils Gold is nothing but heat, let’s discuss the sweetness that made me fall in love! The sweet fruits used in Devils Gold are perfect matches for the peppers….the nice acidic tang of sweet pineapple and orange combined with the smooth pear and papaya. The result is a fresh, almost tropical blend that balanced the heat without diminishing any of the kick! The splash of vinegar added to the tang, and the “spices” are so well blended, that I couldn’t really discern individual flavors (that’s a good thing, by the way!) A natural as a salad dressing with a little olive oil, cracked black pepper, and red Hawaiian sea salt, it also complimented most everything I used it with – tilapia (pictured), pork, chicken, black beans (awesomeness when I threw in a little of my favorite Bajan style mustardy sauce for balance), and perhaps the best- pizza!!!! It wasn’t the best for steak, turkey, and some veggies, so it may not be as versatile as some sauces given its flavor profile, but that’s not a detractor or a negative at all. Most gourmet quality, artisan sauces aren’t made for general purpose! So what’s the overall impression, folks? I think this is an excellent, 4 Fiery Worlds rated sauce!! Hot, sweet, playful, and fresh, and a great addition to any Chilehead sauce cabinet!!! I want to thank Merle and Diana for sending me these wonderful sauces to check out and review, and I appreciated their openness to wanting constructive feedback, and not just asking for an empty endorsement, which I don’t give, by the way. The only problem was that there was little, or any “constructive” feedback to share, except for them to keep making these sauces year round! And why should they make all their sauces year round? Because, Ladies and Gentlemen……It’s a Fiery World! 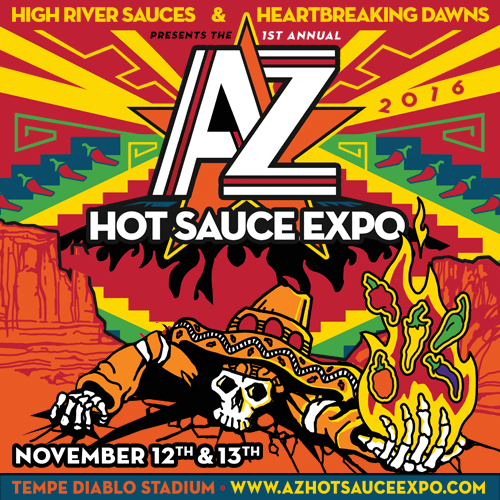 I gotta tell you….There are a LOT of hotsauce companies out there these days! With the spicy food industry being the 8th fastest growing industry in the country, it seems like every time you turn around someone is throwing their hat into the saucemaker ring. And that’s not a bad thing, at all. The more the merrier. However, in a recent discussion with a saucemaker who’s been around a while, they commented that lots of budding hot sauce companies don’t survive their first year. Well, ladies and gentlemen, I’m here to tell you that the company I’m profiling here won’t be in that category. Rarely have I seen a more creative, well designed, well executed line of sauces than Jeremy Walsh’s Big Fat’s! 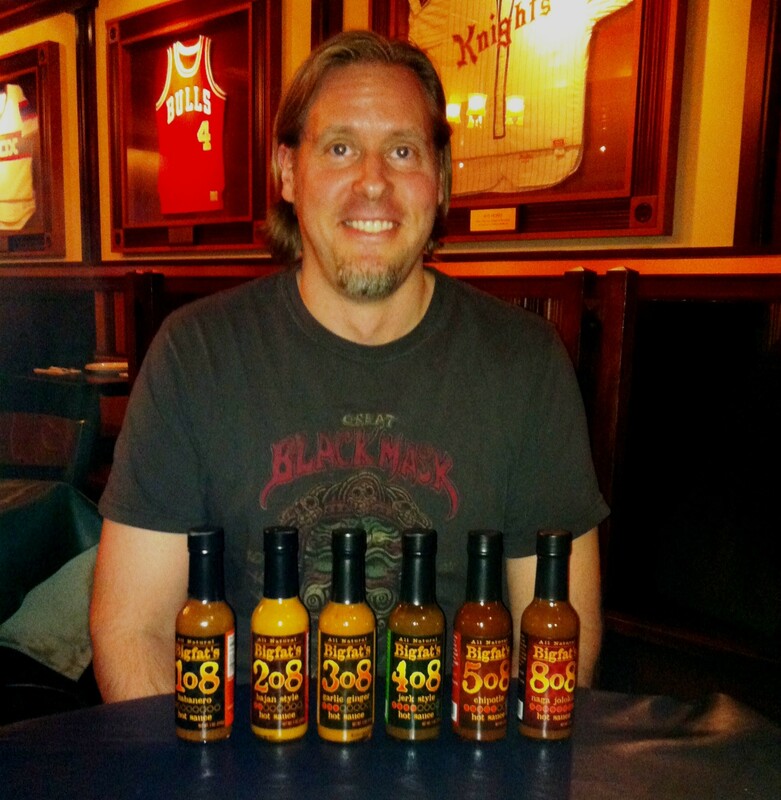 His line of sauces, with simple, easy to remember names (108, 208…ending with 808) definitely have what it takes to establish themselves as a trusted, steady name in the whole big fat hot sauce industry!! Instead of a traditional sauce review, I thought I’d do something a little different and just profile six of Big Fat’s sauces as a group. One reason is to show how Big Fat’s packages their product line and the other is because I learned that the flavor profiles of one sauce often compliment another in the lineup, which lends to mixing them together to achieve new flavors and unique uses. 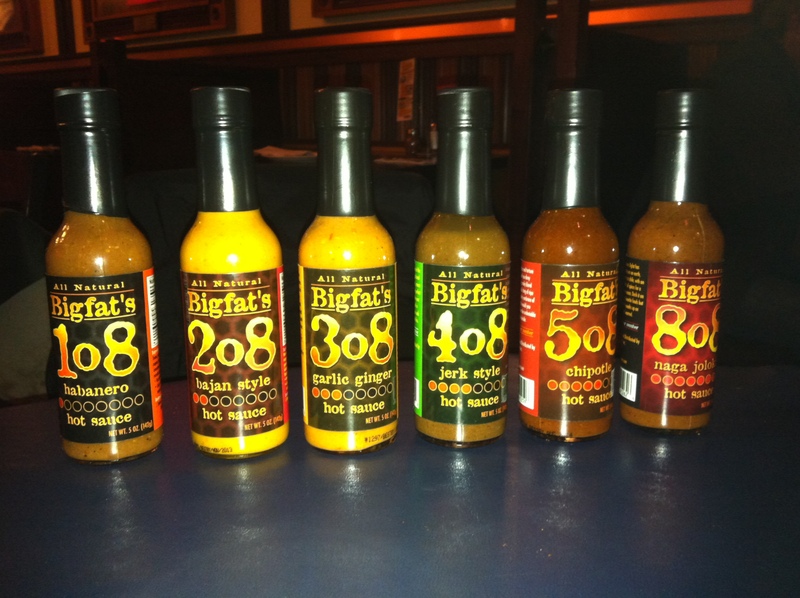 As you’ll see in the pictures, Big Fat’s markets their sauces mostly by number, with the unique product name directly underneath, accompanied by a numeric marker, which serves to identify the number and the heat level. Very, very clever! You all know I’m big on labels, and lots of small batch sauce makers could learn from Big Fat’s labels. Catchy font styles, uniform look, company name very prominent, great shelf appeal, and clever product descriptions and catch phrases all set this sauce line up for success. Every label sports the catch phrases “Big Fat’s Got Your Number!” and usage instructions, “1.Shake it 2.Use it 3.Love it 4.Repeat”! The “got your number” is a very clever word play on a popular phrase but alluding to the fact that they have a number sauce to meet any tastes. I was impressed before I opened the first bottle. But I know it’s about the sauce, so what about them? The 108, which has been frequently reviewed on various sites, is the entry level, habanero sauce. It has more flavor than most hab sauces and with more complexity. I instantly pick up the onion and garlic, and a slight, slight hint of sweetness from the tomato and the basil. But I didn’t lose the flavor of the habaneros, which I enjoy. Also, as with all their sauces, the 108 has only 20mg of sodium (salt). When I asked Jeremy about this, he said it was purposeful, allowing the user to determine how much salt they wanted on their food. Very smart! And the 108 doesn’t list vinegar as an ingredient! it has lime juice to provide the necessary acidity to pull out the various flavors. Very nice hab sauce that goes with almost anything, from eggs, to pork, beef, mexican, veggies, etc etc etc!!!! The only constructive comment I could give about this sauce, and a couple others, is that they are very thick and takes a couple thumps on the bottom of the bottle to get the pour started! But that’s a minor, minor element in the big fat picture we’re painting here!!! The 208 is a bajan sauce, with an obvious inspiration from Barbados, in the West Indies. A not so typical caribbean style, mustard based sauce, it picks up the habanero based heat another notch (remember…108, 208, etc etc!?) and uses yellow mustard with just the right blend of onions, carrots, garlic, and vinegar (way down on the ingredient list) to round out this bright, island inspired sauce that pairs extremely well with pork, veggies, black beans, and also in combo with the 308 garlic ginger sauce for a nice salad dressing. Speaking of the 308, this sauce didn’t last long in my supply,and I desparately need a refill!! 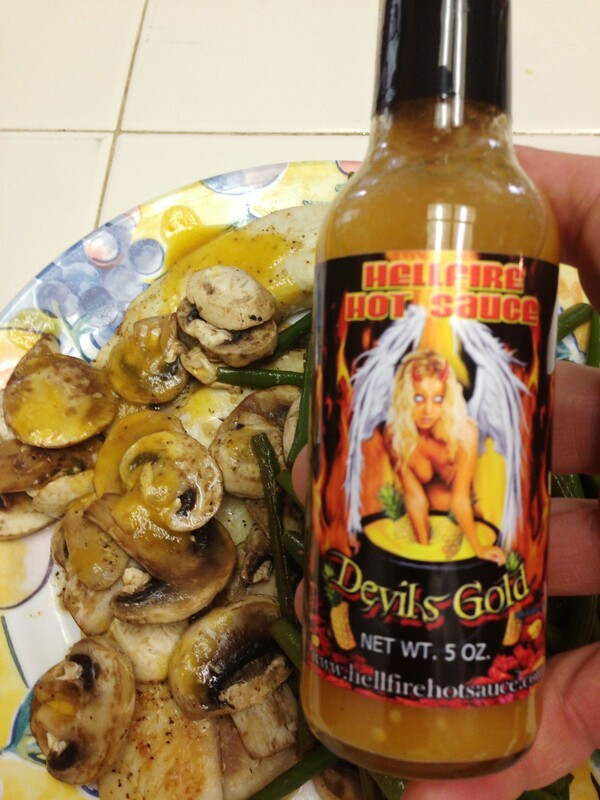 I reviewed this sauce for ILoveitSpicy, so catch that review for more info on the 308. As a brief refresher, it is Thai influenced and uses an ingenious mix of habaneros combined with the ginger and garlic, carrots, apple cider vinegar, sea salt and lemongrass. This sauce makes a mean pork marinade, salad dressing (by itself and with the 208). It is an excellent sauce with again, increased heat. The 408, or jerk style sauce, was the surprise for me. I’m picky about my jerk sauces, so I was a little skeptical, but became a believer. the use of green onion, habaneros, and brown sugar combined with pomegranate molasses make this sauce an outstanding compliment for chicken, pork, and shrimp (that’s what I used it on). The pomegranate molasses is a very clever flavor move, since you get the slight bittersweet of a molasses combined with a slight tangy zing from the pomegranate. And here’s a surprise – On their website, Big Fat’s says that this sauce makes a great iced coffee. I almost laughed out loud at the thought and as I was prepping the review I did on this sauce for ILoveitSpicy , I tried the iced coffee trick! And can I tell you it was outstanding!!! It was that moment that really caused me to appreciate Jeremy Walsh’s creative genius behind his sauces. The 508 is a habanero based chipotle sauce and sets itself apart from the plethora of chipotle hab sauces with a clever spice blend and use of tomatoes, cilantro, and enough habanero peppers to make you wake up and say, “WHOA”!!! 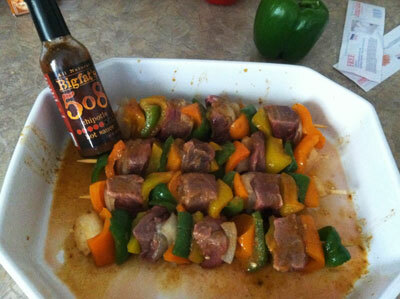 It pairs with everything from eggs to fajitas, to steak (add it to some steak sauce!! Just sayin…..), chicken, shrimp, cheese, cardboard, asphalt, etc etc etc. It’s that good! I haven’t had the 608 Pineapple Habanero Hawaiian inspired sauce yet, but the reviews I’ve read have been excellent. I’m not surprised. I need to try some soon. The chile garlic 708 sauce is due out in the fall, and I can’t wait to try both of these sauces. Last but not least, we have the 808 naga jolokia sauce. Not just a straight heat, vinegar, yada yada..blah hot blah…ghost pepper…yawn sauce, Big Fat’s honored the naga jolokia pepper’s origins, and used Indian inspired flavor profiles. Very, very nice and very, very hot, this sauce packs a mean heat punch but not a knockout punch, making it suitable for folks not in the “I want to kill myself with the hottest thing I can find” category! This sauce also has a little ancho chile in the mix for a flavor twist, allowing for a nice layering effect with the heat profile. I would use this sauce to compliment an Indian dish, or to jazz up a pot of something on the stove, but do be careful just pouring it on a steak or….(oops! Indian flavor profile! Scratch the beef reference!!) chicken, pork, shrimp, etc etc etc. Not surprisingly, this is the only one of the six sauces I have that still has a lot left in the bottle! So there you have it! I have to apologize to Jeremy for taking so so long to profile his outstanding lineup of sauces, but it has allowed me to experience them in my daily journey of flavor and heat, so I feel pretty well equipped to comment….and to brag on him! So like I said, folks…. Jeremy Walsh’s Big Fat’s Hot Sauce gives you Big Fat Flavor, Big Fat Heat, Big Fat Creativity, and makes for a Big Fat success in the hotsauce world!!! Thanks for reading and remember, It’s a Fiery World!